Does this describe your work areas? Based on the Japanese words that begin with ’S’, the philosophy of 5S focuses on effective work place organization and standardized work procedures. 5S reduces waste and non value added activities, simplifies work environment and in the mean time improves quality efficiency and safety. 5S is a methodology for organizing cleaning, developing, and sustaining a productive work environment. The first step focuses on eliminating unnecessary items from the workplace. An effective visual method to identify these unneeded items is called red tagging. A red tag is placed on all items not required to complete your job. These items are then moved to a central holding area. This process is for evaluation of the red tag items. 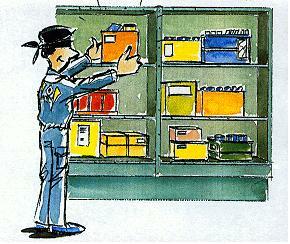 Occasionally used items are moved to a more organized storage location outside of the work area while unneeded items are discarded. Sorting is an excellent way to free up valuable floor space and eliminate such things as broken tools, obsolete jigs and fixtures, scrap and excess raw material. This step will also help with the „just in case” attitude. This step is based on finding efficient and effective storage methods. Once you have eliminated junk and clutter and identified necessary items you are ready to take the next step: clean the work area. Daily follow-up is a must for this activity to sustain this improvement. This step will create ownership and build pride in the workers that they have a clean and clutter-free work area. This will also help the people notice changes in equipment and the production area such as: leaks, vibration, misalignment, breakage etc. If these abnormalities are left unattended they can lead to serious equipment failure and loss of quality, speed, production etc. These all add up to impact your company’s bottom line. Once the first three steps of 5S are implemented focus must be put on standardizing the best practice in the work areas. Give opportunities to employees to take active part in the development of these standards. All the workers area if given an opportunity can be a valuable source of information regarding their work. This is the most difficult part of 5S to implement. Human nature is hard to change. People often want to return to the old ways of doing things. Sustain focuses on defining a new mindset and a standard in workplace organization. The fully implemented 5S will have a positive effect on everyone. People will feel better about their work place and the work they are doing. The benefits are endless. You will have improved safety, improved moral, improved productivity, and improved maintenance. This entry was posted on Tuesday, June 1st, 2010 at 14:58	and is filed under 5 S, Lean, TPM. You can follow any responses to this entry through the RSS 2.0 feed. You can leave a response, or trackback from your own site.